There is a saying that behind every great man there is great woman and in many households, we grew up witnessing that first hand. Many great kingmakers that have chosen to live in the shadows instead of the light and in doing so letting “ The King” give the appearance of ruling. But in doing so, greatness was bestowed on only one person, not knowing that the collective of the husband and wife was what produced what was created. The Wife is just such a story, but it could be the story of so many others. Joe Castleman ( Jonathan Pryce) is about to be opened up to the thing his whole career as a writer was building up to . The mountain top of his writing I am referring to is the Nobel Prize in literature, or what anyone would consider the cherry to the sundae of life. Joe’s wife Joan is just as ecstatic that her husband’s writing has just been given the greatest seal of approval any writer could ask for. What follows is a celebration as Joe basks in the glory of his reward all the while Joan as with their whole life lets him revel in it. As everything might seem perfect on the surface, there are cracks that have formed over their lives, mostly caused by Joe’s infidelity and a secret that Joe and Joan only know. While at the ceremony for Joe’s award, certain things are brought to light as is the question to who really should be the one getting that oh so coveted prize. I have always wondered what goes through an actor’s mind when they get a part that just screams ‘amazing’. I would like to think a little jumping on the bed and a celebratory fist pump to the sky. The Wife feels like it was one of those scripts that would bring on such a moment, a script written by Jane Anderson from Meg Woltzer’s novel of the same name paves the way for a brilliant performance. Lucky for the writers they didn’t need to make anyone great, as greatness was already supplied in the form of Glenn Close. There is very little in words that can be said to describe the performance Close gives, and it will leave you speechless. She is everything in this film, but the film is helped by not just her tremendous talent but also by the likes of Christian Slater, who needs to be in more things, and of course the incomparable Jonathan Pryce. All three are good, but it is Close who gets the spotlight as she lets everyone know she deserves it more. While the stellar acting drives the film, the story is not just a passenger as it gives the push to make what you see on screen so engaging. I really enjoyed this film and for all the reasons I stated above. 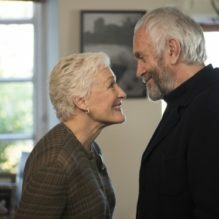 The Wife doesn’t just feel like a showcase for actors to show of their talent with solid material, though it does help, what is also reminds us it that Oscar season is upon us, and this is one that is primed for the big game.